Providencia/ de Dios con Ysrael/ y/ Verdad de la Ley de Moseh y nu/ lidad delas demas leyes./ Compuesto por el Señor H.H./ morenu arab Ruby Saul Levy/ Mortera de buena memoria./ En la Ciudad de Amsterdam lo escri/ vio Iehudah Machabey en el Año de/ Cinco mill Y quatrocientos y veyntey qua/ tro que corresponde con el Año de MDCLX/ IIII. Providencia de Dios con Israel. Polemical treatise by Saul Levi Morteira. Spanish translation by R. Moses Raphael d’Aguilar. Written by Judah Machabeu. 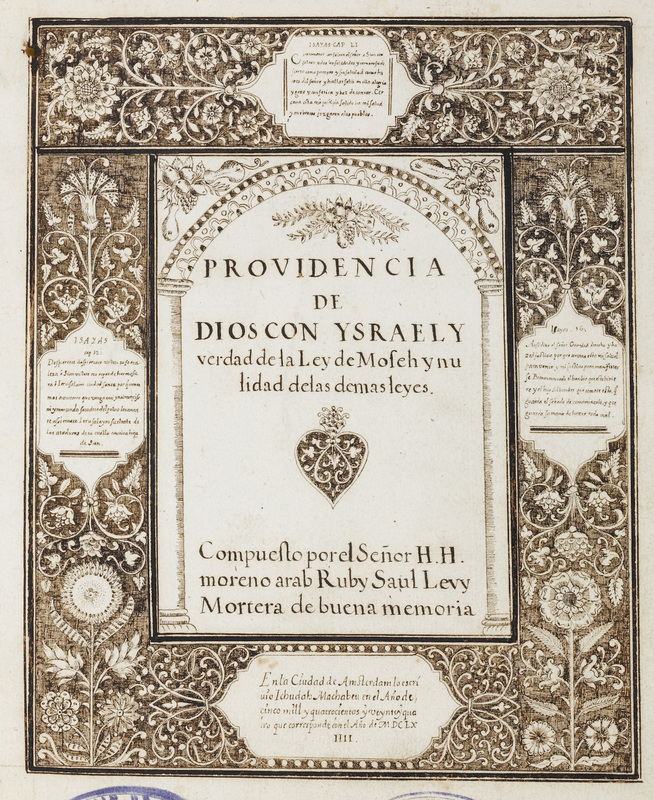 Amsterdam, 1664.
f. 1r: Title: Providencia de Dios con Ysrael y Verdad de la Ley de Moseh y nulidad de las demas leyes. f. 221r-223r: Table of contents. The original work was written by Saul Levi Morteira in Portuguese. Once it was completed, it was sent to Moses Rephael d’Aguilar, Haham of the Sephardic congregation of Amsterdam, who revised and translated it into Spanish. Aguilar also enlarged the work with a last chapter. After his death in 1679, the manuscript, which had remained in Aguilar’s possession, went to his son-in-law Joseph Franco Serrano and, upon the latter’s death, to his son-in-law Jacob Abenacar. Several copies of this text repose in this collection. Cf. EH 48 A 9; EH 48 B 1; EH 48 B 16; EH 48 C 10; EH 48 C 11. Herman Prins Salomon (ed. ), Saul Levi Mortera. Tratado da Verdade da Lei de Moisés. Escrito pelo seu próprio punho em Português em Amesterdão 1659-1660. Ed. facsimilada e leitura do autógrafo (1659), Introdução e comentário por […], Coimbra, Imprensa da Universidade, 1988. Spanish / Paper / +212 [213-219] ff. (last 3 ll. blank) / 28 lines to a p. / Calligraphic Iberian writing / Title written in beautifully drawn frame / The title page is decorated with delicate ink drawings of flowers and plants / At the top and at both sides are verses from Isaiah written on white background / Drawn decorations and initials at the beginning of each chapter / Contemporary gold-tooled leather binding. Fuks 189. Kaplan 177. Fundação Calouste Gulbenkian.